PGA West Palmer Course Hole 4: After easing into the round with three fairly pedestrian holes, the fourth, although short, has water in play on both shots, so accuracy and distance control is very important. PGA West Palmer Course Hole 5: This brutal par 3 "Intimidator" is long and leaves no room for error. The tee shot must fly close to 200 yards to carry the water and there is no true bail-out area unless one goes way right. PGA West Palmer Course Hole 7: The tee shot on this long par four must find its way between the lake to the right and the OB to the left. If the tee shot can be mastered, the second is more manageable. PGA West Palmer Course Hole 9: Armed with the knowledge that the ninth has been one of the top ten hardest holes by stroke average on the PGA tour from time to time, the golfer can step to the tee with very little confidence. At 461 yards from the tips and well over 400 yards from the Blue tees, this dogleg left “Tyrant” of a hole requires two long, accurate tee shots to avoid the lake running down the entire left side of the fairway. PGA West Palmer Course Hole 10: Coming off the treacherous ninth hole, there is no rest for the weary on the tenth as the tee shot is very intimidating. There is water that must be cleared, which is no small feat. The water continues down the left side to the green. Of course, the right side of the hole is riddled with bunkers from fairway to greenside and uneven lies with angles more towards the water, so hit'em straight here. 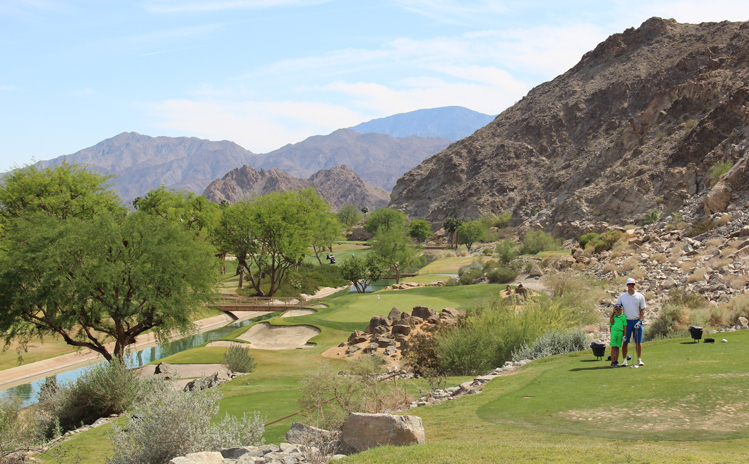 PGA West Palmer Course Hole 13 (right): The thirteenth is a picturesque par four that is nasty from tee to green. The water that runs down the right side from tee to green is very much in play on both shots. At over 400 yards, the golfer won’t have the option of being timid either. PGA West Palmer Course Hole 14 (below): This long par five gives the golfer the first encounter with the canal that will plague them for the next four holes. Aptly named “Venice” the golfer may think the canal won’t come into play off the tee as it is well to the right and there is a nice, wide fairway to hit. It isn’t until the golfer can’t find the green from the fairway that they realize that it is on the other side of the canal, sandwiched between the water and the mountainside. This tough proposition will continue on the holes to come. PGA West Palmer Course Hole 15: The fifteenth is the first of two downhill par threes nestled between the canal and the mountains. This one is a little longer and a little more forgiving than number 17, but difficult nonetheless. 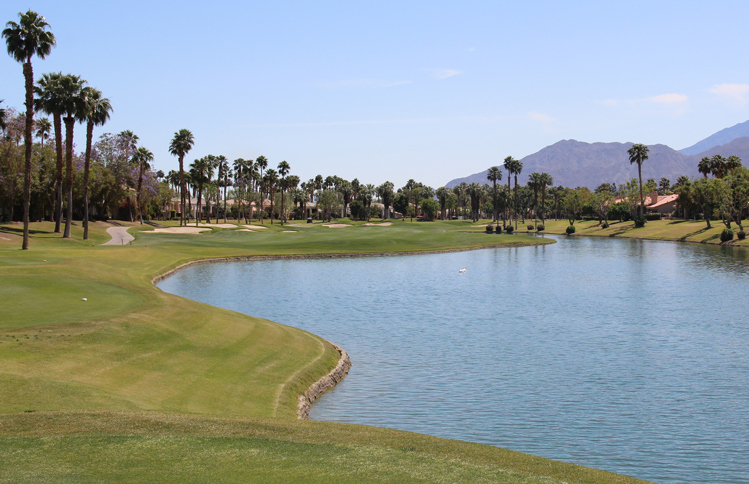 PGA West Palmer Course Hole 16: This great, short par four is a showcase hole for the course. Featured on the Disneyland California Adventure Ride “Soaring Over California”, this hole is a phenomenal example of building a hole around existing hazards. The elevated tee shot must clear the canal. However, the farther from the canal that shot gets, the tougher the approach will be back over the canal to the narrow and undulating green backed up by mountain and surrounded by heavy rough. PGA West Palmer Course Hole 17: The shorter of the two canal par threes is extremely tight as anything pushed right of the sliver green will most likely hit the mountain and careen towards the canal. 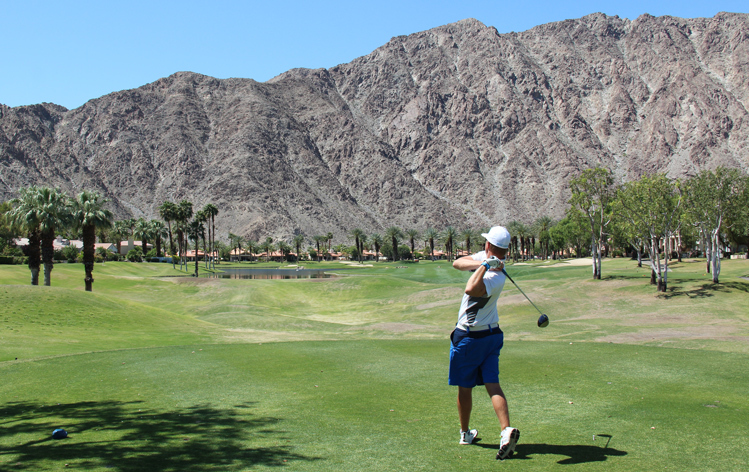 PGA West Palmer Course Hole 18: This finishing golf hole is pretty and the golfer can try for the green in two if they’re feeling confident. The trouble is obvious as the lake extends from tee to green down the left side, and cuts in front of the putting surface to ensure all shots must fly onto the green for success.